Monitoring Service - Altoona, PA | Smithmyer’s Electronics, Inc.
Our monitoring service operates 24 hours a day and seven days a week to ensure what you want to protect is safe and important people are secure at all times. We are here to respond quickly whenever our clients need it in an emergency situation. Our team monitors every security system purchased from us with the latest technology in the industry to keep you safe. When you purchase a security system from Smithmyer’s Electronics, Inc. you will receive one free year of monitoring service. After the first year it will be an expense you can invest in knowing that you are protected. Our monitoring system team is highly trained to respond quickly, because at Smithmyer’s Electronics, Inc. we know time is important in getting the help our clients need. Our monitoring team’s number one goal is to provide the best security and the best customer service. Smithmyer’s Electronics, Inc provides alarms systems and monitoring for a reasonable price. When you purchase your security systems from Smithmyer’s Electronics, Inc. you can trust in the best security and monitoring services in the area. Our customers can feel safe knowing there is always someone monitoring your security systems incase something were to happen. Smithmyer’s Electronics strives to meet your needs even when you are not present at your home or business. While you are away from home or business you do not expect something such as a burglary, or fire to happen. That is why our monitoring service has someone watching your property 24/7 for when the unexpected happens. When needed our monitoring service will immediately notify emergency responders of the situation and have someone at your property quickly who can help. Protect Yourself with the Best from Smithmyer’s Electronics, Inc. Installing an intercom system to the front door of a home can also help homeowners see who is outside before opening the door. With today’s modern home intercom systems you can listen to audio and view video with clarity of who is standing at the door. The installation of an intercom system in your home is easy and requires little wiring, and with some models there is the option to go wireless. 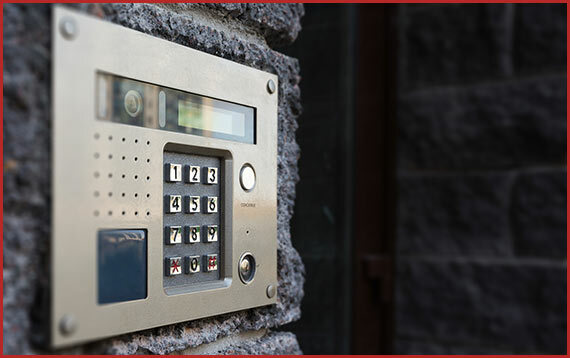 Intercom door systems are also a great option for apartment buildings and other multi-tenant buildings.